wells fargo is still a bunch of hacks; same scoundrel learning new tricks. i ordered my credit card the 29th of october. 5-10 business days later, still nothing received. as a precaution, i called in & cancelled the card to order a new one on the 14th on november, 12 business days later. surprise surprise, i received my defunct original card in the mail 3 days later on monday november 19. i figure their incompetence will repeat itself on my 2nd card and decide to wait 17 business days until i call in to ask about the status of my card. all they can tell me is that i had ordered it on the 14th of november. so on the 7th of demceber when calling in i decide to give it 5 more business days and still nothing. i call in on today, the 14th of december and request that they put some pep in their step and they inform me that they can FedEx my card and that it should arrive in 3 days, monday. i don’t get upset with the representative and ask if my promotion period to spend $1000 in 3 months would be set back to a reasonable date, somewhere like the 14th of november when i ordered my 2nd card. they inform me that it is a set timer that began when i first “opened” my acct on the 29th of oct and that i’d have to wait 15 months before i could be eligible for any promotional offer again. my warning that if possible, obtain a credit card from a brick & mortar bank that can hand a you card that day. wells fargo has gone from opening duplicate accts on people’s mortgages to delaying when you would ever get a card from them so that it is less likely you’d spend the full $1000 and receive the $200 reward. they are still criminal and although my current bank of america is ghetto by imposing a bank charge when you turn 24 years old, id rather drive down the street and get a card with the same cash back. if you currently have a WF acct that you're not willing to part ways with, i hope you can at least take away that if its been open for 15 months, i suggest you cancel it and reap promo rewards before they devise another method of scamming you out of more money. if you’ve recently ordered a card and are still waiting on it, i suggest you cancel it so they can FedEx to you so that the same trickery doesn’t happen to you as it did me. I thought, c'mon, how bad could it really be? The answer: so, so, SO bad. You can only redeem rewards in $25 increments (annoying and unnecessary). Oh, and that nice bonus they talk about-- I think mine was "Spend $1000, get $200)"- well, I got it FOUR MONTHS after reaching and fully paying off my $1000 mark, and it took several phone calls to actually get it at all. Avoid this card at all costs. Terrible customer service, terrible policies, and shady on whether or not you'll actually get that bonus you were promised. The best part of this card was calling to cancel it. Steer clear of Wells Fargo. Don't count on your bonus! I activated this card four month ago and still have not received my bonus. I called the company and asked them about it. They said I did qualify for the bonus and should get it anytime. Two month later I am still waiting. Yeah, if you read it, after you're eligible for $200 bonus, it takes 90 days to receive it. It's not even in fine print, it's actually in BOLD print. It's actually pretty cool to receive $200 cash back for spending $1000, no matter when it arrives. It's free money, be grateful. Thay are the worst banking banking institutions. Bank credit cards are awfull, terms are bank and they have zero flexability to lower your interest on exceptional credit scores such as mine. They give you the cheshire cat grin when you go to the bank in person while saying things that are untruthful. 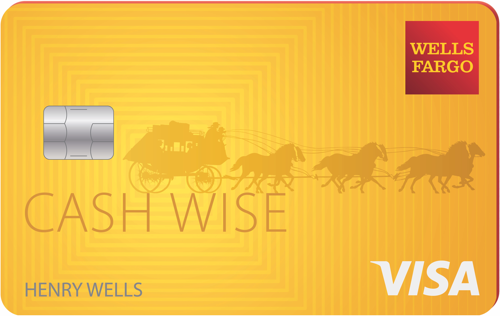 there are way better banks and credit cards then using any products from Wells Fargo. Wells Fargo investments in Birmingham is a quality investment firm. My advisors have done very well investing my money. The bank/branch side at Wells Fargo might be a joke but not the investment side. Why on Earth would anyone still do business with Wells Fargo? Why would Credit Karma push any Wells Fargo product? Because it's the fourth largest bank in the country? Just guessing. Because Wells Fargo investments in Birmingham is a quality investment firm. My advisors have done very well investing my money. The bank/branch side at Wells Fargo might be a joke but not the investment side. Yet not a word about the credit card you were supposed to be reviewing? This card is a real sharp looking piece of plastic and the smooth silky finish enables it to easily slide into (and out of) a wallet. The only card (I only have no AF cards) that has the same level of aesthetic quality is the Amex Cash Magnet. It’s become my “main wallet” card because I like how it looks and feels - but I don’t carry a balance, don’t play reward point games, and have a stable of Cap1 QS, Discover It, and Amex Cash Magnet for “other situations”. The best reward card I have ever had and received the $200. Not sure why others have not. Will not be disappointed with this card. Will you get the $200 bonus? I spent well over $1000 in the first month, but never got the $200 bonus. I guess they don't count paying utility bills with it towards the $1000. I ended up cutting the card up. Never will do business with Wells Fargo again. Has it been over the 1-2 billing periods since reaching the $1K? Terms state "To qualify for the $200 cash rewards bonus, a total of at least $1,000 in net purchases (purchases minus returns/credits) must post to your account within 3 months from the date your account is opened. The bonus cash rewards will show as redeemable within 1-2 billing periods after they are earned." Forget ever getting the $200 bonus. I signed up for this card 5 months ago and spent well over $1000 in the first month. I never got the $200 bonus. I'm cutting up the card today and will never do any business with Wells Fargo again. Did you pay the $1000 back? Of course I paid the $1000. On time and in total. This is a god awful company. Rebranding isn’t going to give this company any better PR as it can’t undo the past. Decent rewards and easy to pay. This was the first card that gave me a generous limit. Also, the rewards are pretty decent. My interest rate is high however. I know WF has been in the hot water lately but i've never had a single issue with them or this card and i've been banking with them for over 15 years now. Card itself is ok, decent rewards but it's also not my main card. I do use it to pay our family's cell phone bill as it includes cellphone insurance up to $600 per incident with a $25 deductible and covers up to 4 lines which is what we have. We've taken advantage of that feat. alone a few times as my kids do break their phones often. Reward system is very simple as it just autodeposits it into my checking account. In case you're interested i was approved for 20K limit with an 825 score. I did get my $200 sign up bonus after 3 statement periods. Overall i think it's a great card, just not sure why so many people are bashing it in their reviews. I think you can just claim 2 phones per fiscal year, each one up to $600 with a $25 deductible. Coverage is for up to 4 lines, up to 2 claims per year with a $25 deductible. You can read their full disclaimer if you google for wells fargo cellular telephone protection.